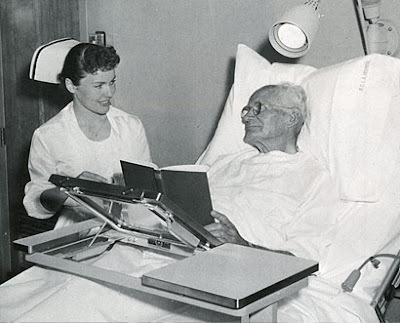 This 1955 photo depicts the first patient to have an operation at the UCLA hospital. At a time when the University of California Board of Regents is raising student fees, it is imperative that they show leadership and fiscal responsibility for two years by not granting raises or bonuses for employees that make in excess of $150,000 per year. The Legislature urges the Regents of the University of California and the Board of Directors of the Hastings College of the Law to adopt the policy expressed in this section for individuals employed by those entities. As earlier posts on this blog have noted, the administration recently circulated an email containing a statement that commercial business was not going to be possible under the plan to build a hotel/conference center to replace the Faculty Center. The no-commercial rationale was based on the idea that if the University took commercial business, it would have to pay taxes. Meeting planner Ronni Epstein is giving her cost-saving effort the old college try. 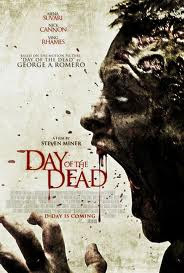 Epstein, regional director of development for Crohn's & Colitis Foundation of America, has a slashed budget this year. So returning to the Millennium Biltmore Hotel in downtown Los Angeles for the foundation's annual convention would be out of the question. Instead, she's going to an unlikely venue: University of California-Los Angeles. UCLA leases its conference center to groups looking for places to meet and at the right price for Epstein — about half what she spent last year. "I'm surprised we didn't think of it sooner," she says. "I went to college, too, and I don't remember the school having conferences." Some planners bypass full-service hotels altogether. Colorado-based Unique Venues, which matches meeting planners with non-traditional meeting venues, has seen the number of leads grow 30% in the last year, says President Chuck Salem. In addition to university campuses and suburban conference centers, even camps and cruise ships are generally more affordable than full-service hotels in city centers, Salem says. An overnight meeting at UCLA, for example, can start at about $135 a person, including a meeting room with audiovisual equipment and three meals, he says. And it's not dorm cafeteria food. 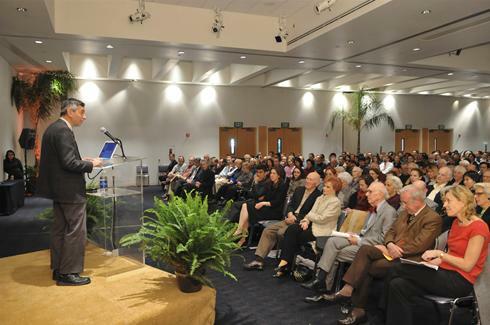 The article contains the photo above with the caption: "Meeting attendees gather at UCLA's Covel Commons, a conference center the university rents to companies and associations." The photo's caption also attributes the image to Felicia Caldwell of UCLA, not a USA Today photographer. Ms. Caldwell is listed in the UCLA directory as "Photographer & Admin Proj Coor " and working for "UCLA Hsg & Hospitality Serv-Mkt & Comm." Evidently, UCLA was not averse to the PR for its services in the article and may have supplied the photo. 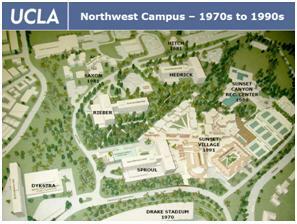 Did You Know About the Other Conference Center / Restaurant / Hotel Being Built on Campus? It describes a building project on the northwest section of the campus - not the Faculty Center location - which will include a restaurant seating 750, a ballroom, and "sleeping rooms" for guests. You can even link to webcams to watch the construction. See the large bold italicized text. 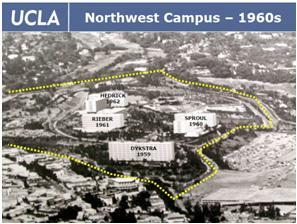 In 1959, UCLA opened Dykstra Hall–its first residence hall on the northwest campus. During the past five decades, we’ve added high-rise residence halls, plaza rooms with private bathrooms, and suite-style accommodations. Now, the northwest campus is lovingly referred to by students as “The Hill,” a vibrant community of almost 10,000 student-residents during the academic year. To meet its goal of providing four years of student housing for all incoming freshmen, UCLA is currently building 1,525 additional bed spaces. This project will have a huge impact on UCLA’s summer conference program. Not only will we have more than 1,500 additional sleeping rooms for conference guests, but also additional meeting spaces, a brand new residential restaurant with seating for 750, and a ballroom with views of the UCLA campus for up to 450 guests. All of the new buildings achieve the U.S. Green Building Council’s “LEED Silver Rating” and are scheduled to be completed in Fall 2013. Governor's Possible State Budget Deal with GOP Reported to be "Dead"
Brown is considering alternative ways to put tax extensions on the ballot, either by a majority in the Legislature or by a ballot initiative. He suggested in his release that he may be skeptical of the majority-vote approach, saying the Constitution requires a two-thirds majority. If the talks are truly dead, the issue of the November ballot initiatives (see earlier blog posts) arises. One, as noted in prior posts, would impose a 60% cap on public pensions, clearly for new hires. Exactly what it intends for existing workers - the initiative is badly drafted and may be amended at this stage - is unclear. It does explicitly cover UC and thus would override the Regents' changes in the UC pension plan of last December. 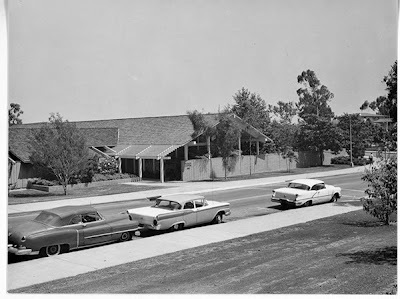 If you have been tracking some of the old photos of UCLA on this blog - or just know some UCLA history - you know that UCLA began by taking over the campus of the State Normal School on Vermont Avenue before the move to Westwood. But the State Normal School itself had an earlier history. It was first located on the site of what is now the Central Library of LA City. 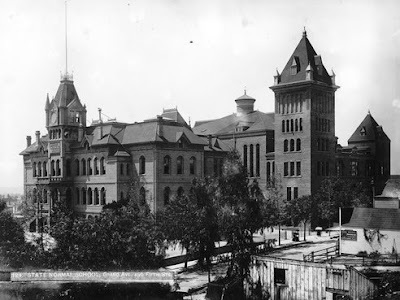 This photo shows that downtown campus circa 1900. In yesterday's post on this blog about the proposed hotel/conference center that would replace the Faculty Center, the most recent statement on the project from the administration was included as an update/link. The Center is shown here on the right, back in the day (when budgets were flush). That latest statement is puzzling as it refers to the consultant's report on the project and yet seems to contradict it. The consultant seemed to assume that there would be outside (non-UCLA) business conducted at the hotel/conference center. The consultant's report had estimates of taxes to be paid. However, the most recent statement from the powers-that-be at UCLA says there will be no commercial business - because then the hotel/conference center would have to pay taxes and tax-exempt financing would not be available. "If you’re a family from Chicago coming to L.A. to go to Disneyland, you won’t be guests at UCLA’s residential conference center,” Morabito said. “But if you’re a faculty member from the University of Chicago, and you’re coming here to give a seminar or visit with UCLA colleagues, if you’re coming to use our libraries or for a conference, then you’ll be welcome. ...In any case, tax laws prevent UCLA from operating a private business such as hotel, said Steve Olsen, vice chancellor for budget, finance and capital programs. “UCLA has to abide by these private-use restrictions in order to be able to use tax-exempt financing,” Olsen said. If the consultant assumed there would be commercial business, but now there won't be, wouldn't the consultant's estimates of occupancy rates be too high? If UCLA pledges to take only UCLA business at its hotel/conference center, doesn't that still divert business away from commercial hotels in the area that now handle that business? If so, doesn't that reduce tax revenue from those hotels going to local jurisdictions? Exactly what is commercial-prohibited (non-UCLA) business? What is the status of the following examples, commercial-prohibited or UCLA? - Are relatives and friends coming to a student's graduation commercial-prohibited business or UCLA business? - If someone on UCLA business - say a guest speaker in a campus program - wants to stay some extra days before or after the official event for personal/touristic reasons - is that commercial-prohibited business? - If a UCLA faculty or staff member wants to put up a guest here on personal/touristic business, will that be allowed or is it commercial-prohibited business? - If a retired faculty or staff who now lives out of town wants to come to LA and stay at the hotel for personal/touristic reasons, is that commercial-prohibited business? - Can a graduate of UCLA who now lives out of town stay at the hotel for personal/touristic reasons or is that commercial-prohibited business? - If parents are taking high school seniors on college tours and want to visit UCLA, could they stay at the hotel? Or is that commercial-prohibited business because the senior is only a possible applicant for enrollment? - If a non-UCLA individual wants to stay at the hotel to visit someone at the UCLA hospital, is that commercial-prohibited business? As has been noted on previous blog posts, UC is in danger of letting the pension issue get away from it. The governor has – according to news reports – agreed to a $106,000 cap on public pensions. Legislative Republicans have filed an initiative putting a cap of 60% of final pay on pensions. Both caps clearly apply to new hires and clearly do not apply to those already retired. There is uncertainty about what would be applicable to current employees. The initiative – which is poorly drafted – explicitly covers UC. We don’t know about the possible $106,000 cap deal on that score, although there is no reason to assume the governor has excluded UC from a more general deal on all public pensions. A major problem is that we have no indication that anyone at UCOP or the Regents is communicating directly with the governor. Even apart from the personnel issues of revamping the UC pension plan, both UCOP and the Regents ought to be concerned with protecting the constitutional autonomy of UC. There is more at stake than just pensions. But UCOP and the Regents appear to be out of the loop. The excerpt below from today’s Calpensions.com blog indicates that both the governor and the GOP have concerns about the current makeup of the boards that control the state’s two biggest pension funds: CalPERS and CalSTRS. Basically, the concerns revolve around conflict of interest – union-backed candidates on the boards – and oversight (various recent scandals relating to investment decisions of fund money). As far as is known, no such concerns have been raised by either the governor or the Republicans about the control of the UC pension system. The board that oversees the UC pension system is the Regents, whose members are appointed by the governor and approved the legislature. Since neither the governor nor the legislative Republicans seem concerned about the Regents as trustees of the UC pension, that view would give UC an opening for arguing that UC’s pension should be left in the hands of the Regents and not thrown in with some broad reform of all public pensions. The Regents last December already approved various pension changes and a funding plan for the UC retirement system. Of course, for that argument to be made, UCOP and the Regents would have to insert themselves (now!) into the negotiations between the governor and the GOP legislators. Should the makeup of the governing boards of the two big state pension funds, CalPERS and CalSTRS, be changed? The issue edged into the spotlight last week, pushed from the shadows by rising government pension costs and a CalPERS corruption scandal. It’s not the major overhaul advocated by some, where the traditional stakeholder board of management and labor representatives is replaced by a board majority chosen for their expertise in finance and investments. That kind of change happened in San Diego, one of the first public pension meltdowns, and in San Jose, where Mayor Chuck Reed successfully pushed pension reform ballot measures last fall. - Governing board conflict of interest and greater transparency (Admin: Add 2 public members to each retirement board. For CalPERS, switch SPB representative to DOF).” The abbreviations for the California Public Employees Retirement System switch refer to the five-member State Personnel Board, which handles civil service issues, and the administration’s Department of Finance. One of the eight points in the pension reform plan Brown issued during his campaign calls for “independent oversight” of the pension funds and monitoring by the Department of Finance. Spring quarter 2011 has arrived. But the issue of replacing the existing Faculty Center with a large hotel/conference center remains from last spring, when news of the plan was (sort of) made public. You will be seeing flyers such as the one on the right and related yard signs in the neighborhoods around UCLA. As the flyer points out, there is a public meeting at the Faculty Center about this issue on Wednesday, April 6, at 7 PM. Earlier posts on this blog have summarized the issues involved. 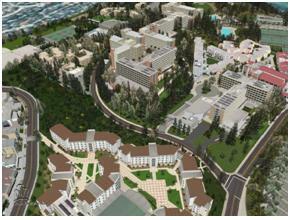 The most recent development was the strong vote against the project by members of the Faculty Club. Picture this on Hilgard and Westholme! - CONFERENCE CENTER YES. HOTEL, NO. Use local hotels and restaurants that pay taxes to the city – revitalize Westwood Village, don’t compete! 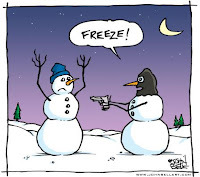 This is urgent! The project will go to the Regents in May. UPDATE: The administration has circulated its version of the proposal today via email and in an article in UCLA Today at http://today.ucla.edu/portal/ut/policy-would-restrict-use-of-residential-199646.aspx. 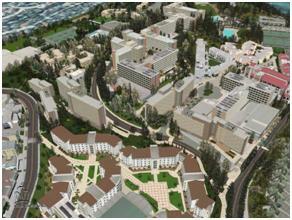 A key element in this version is a pledge that no non-UCLA business would be done in the new hotel/conference center. Of course, that limitation would cut the hotel/conference center off from a potential revenue stream, which - on its face - seems to add to the financial risk. Moreover, it is unlikely to assuage neighborhood groups since the project creates the same objection for them, regardless of whose business it is doing. Finally, commercial hotels in the area are currently getting some UCLA business which will be diverted from them. So they won't be happy, either. Question: The current plan could well lead to litigation, problems with neighbors, local hotels, and local politicians. 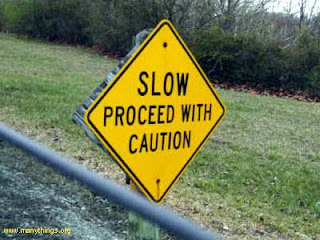 Before the April 6th meeting, wouldn't it be useful to signal that the project planning is being slowed for more review? Wouldn't it be useful to begin thinking about a scaled-back Plan B? Just asking. UCLA was into Green Gremlins in 1972; this one an AMC Gremlin converted to burn hydrogen. Maybe the folks above should have waited for the 1973 models, right Tex? Someone asked yours truly yesterday whether the GOP pension initiative actually covered existing employees as well as new hires. Apparently, there was a report that the Republican legislator in whose name the initiative was submitted had denied it. The article below - as well as the language of the initiative - makes it clear that existing employees are to be included. The article also notes that Gov. Brown is willing to accept a pension cap of $106,000. That is different from the initiative which has a 60% final pay cap. But it is unacceptable for UC faculty and would override the Regents' December decision. If such a pension deal covered UC - and the GOP initiative explicitly does cover UC - it would undermine the constitutional autonomy of the university. Yet, as far as is known, neither UCOP nor the Regents are pressing the governor on these points. A previous posting on this blog reprinted the entire pension initiative so no one could say later that what was happening was unknown. This posting is a second warning. State budget talks between Gov. Jerry Brown and Republican lawmakers deteriorated Friday as Republicans released a long list of proposals to overhaul California government that Democrats said had further divided the parties. According to a document Senate Republicans provided to reporters, they asked Brown for pension cuts to current and future employees, as well as changes to teacher tenure that reward performance and a hard cap on future state spending, among dozens of ideas. University of California at Merced officials say students will soon have more space to exercise and hold meetings… The university recently received approval to move forward with its Recreation Center North project, an estimated 20,000-square-foot recreation building. Jane Lawrence, vice chancellor for student affairs, said the university received an $8.5 million loan from the UC Office of the President to pay for the construction. The university will repay the loan with an existing student fee. No new student fees will be charged. Inside Higher Ed points today to a story in an Austin, Texas paper. The story speaks for itself. UT regents' special adviser losing his job: Rick O'Donnell's criticism of academic research didn't sit well with lawmakers, others. A special adviser with controversial views on research, teaching and other matters was reassigned by the University of Texas System on Thursday to a new job that will end by Aug. 31. The move is unlikely to quell concerns about the direction of the state's largest and most prestigious university system under Gene Powell, chairman of the Board of Regents, whose priorities echo a number of those expressed by Gov. Rick Perry. Two initiative petitions were submitted earlier today. One, reproduced below, deals with pensions. It would explicitly cover UC and, thus, would override the pension changes enacted by the Regents last December. For example, it limits the final pension to 60% of final salary. It covers existing employees as well as new hires. The second is essentially a revival of the old GANN initiative that was passed by voters shortly after Prop 13. The GANN limit restricted the rise in state spending (general fund plus other funds) to the inflation rate plus the growth in population. GANN was essentially gutted in the late 1980s by Prop 98 and a later related proposition that determined spending on K-14 by formula. The pension initiative reproduced below, aside from overriding the Regents' decision, compromises the constitutional autonomy of UC. However, it is unclear what legal action the Regents or UC would take should it pass. While it takes only $200 to file initiatives, typically another $1 to $2 million is needed to hire signature gatherers. Even if an initiative gets on the ballot, if it is controversial, tens of millions of additional dollars in TV and other advertising may be required to promote it. The two initiatives that were submitted, however, appear to correspond to the positions taken by Republicans who have been negotiating with the governor over the "price" of their votes for his tax extension proposal. In turn, the governor has hinted that if he cannot reach a deal, he would go the initiative route which would likely mean a November election. It is probable that if the governor went the November-initiative route, the pension and GANN-type initiatives would also have sufficient money behind them to wind up on the same ballot. As far as can be determined from public sources, UC has not weighed in with the governor concerning its position regarding the pension proposal. For that reason, I am reprinting the pension initiative below in its entirety so it cannot be said from this point on that no one at UCOP was aware of what was happening. Large bold text has been added to pertinent elements in the initiative. D. Government finance experts have determined that the pension and retiree health provided public employees are significantly more generous than other states. It has been reported that more than 15;000 persons receive pension benefits in excess of $100,000 per year. Under the current system, some public employees can actually receive more income in retirement than they earned while working. pension for more years than they actually worked for the government. F. The current system has led to billions of dollars of unfunded liabilities for pension obligations of government employees. The taxes needed to adequately fund such benefits would crush the economy. The investment proceeds needed to fund such benefits are non-existent. 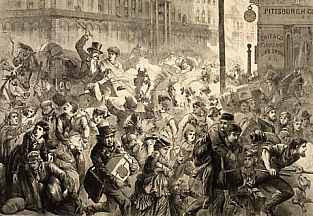 Many local governments will be threatened with bankruptcy if no change is made right now . hired after the effective date of this section, subject to all of the limitations of this section. or death benefits for families of public agency employees. public agency employee under any plan. (2) "Public agency" means the state or a political subdivision of the state, including, but not limited to, counties, cities, charter counties" charter cities, charter city and counties, school district, special districts, boards, commissions, the Regents of the University of California, California State University; and agencies thereof. (3) "Pension" or "pension benefits" means a plan or trust providing a pension, benefit determined by a formula based on factors such as age, years of service, and compensation, or a plan or trust. (i) Nothing in this Section shall terminate, amend, modify or in any way affect the retirement benefits or other benefits provided Members of the Legislature pursuant to Section 45 of Article IV. persons who are receiving or are entitled to receive such benefits as a result of that person's retirement from public agency employment prior to the effective date of this section. The provisions of this Act are severable. If any provision of this Act or its application is held invalid, that finding shall not affect other provisions or applications that can be given effect without the invalid provision or application. This Act shall become effective immediately upon its approval by the voters pursuant to Section 10(a) of Article II. No public agency may enter into any employment contract or collective bargaining agreement providing for retirement benefits in excess of the limitations imposed by this Act. The Public Policy Institute of California (PPIC) takes a respected monthly poll on public attitudes in the state on political and policy issues. The March release is just out. Taken at face value, the public is very concerned about the state budget situation (Figure 2 - scroll down below), there is slippage in support for a special election advocated by Gov. Brown on tax extensions (although a bare majority still support the plan – Figure 3), cutting public pensions is seen as a good way to balance the budget (Figure 4), and the way to reform public pensions is to move to a defined-contribution/401k approach (Figure 5). You will note that I started with Figure 2 in the paragraph above. So let’s take a deep breath before over-interpreting Figures 2 through 5 and start by looking at Figure 1. What we learn from Figure 1 is that most folks, even the politically sensitive “likely voters” crowd, are not spending sleepless nights worry about the state budget. For real people, “it’s the economy, stupid,” not the state budget. Of course, if they are asked about the budget, they will agree that it is a big problem – because that is what the news media are talking about. If they are asked if public pensions are a big problem, they will also agree – and for the same reason. But note the question about fixing public pensions to deal with the budget (about which they are not losing sleep). It refers to the budget “this year.” Even interpreting “this year” to mean next fiscal year, none of the reform proposals, even the most drastic, have a material impact on the budget next fiscal year. All pension proposals are intended to address the unfunded liability of the various plans which is a longer-term issue. As I noted in a prior post on a recent Field Poll, when a public pension question was asked, 48% of voters thought that public pensions were about right or not generous enough. Yet when remedies for public pensions were suggested, these were also supported. What these results really tell you is that the general public, even those more politically attuned than average, are not deeply involved with state and local issues but draw impressions from the news media. Responses to questions are sensitive to framing and suggestion. What voters might do in an actual election would depend critically on how the campaigns, pro and con, market their viewpoints through TV ads and other methods of outreach. Outlines of Plan B on the State Budget? 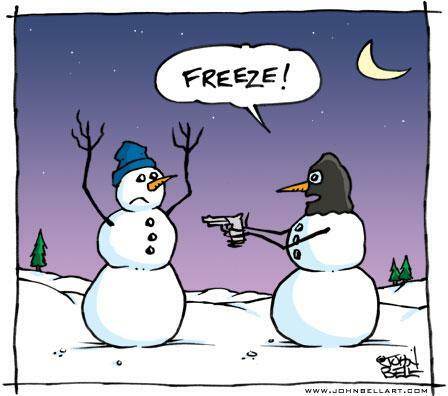 Or Negotiating? SACRAMENTO -- As Gov. Jerry Brown continued to negotiate with Republican legislators on his plan to extend taxes, he also has begun to weigh going it alone, sources said Tuesday. That could take two paths -- forcing a special election onto the ballot through a majority vote in the Legislature, or going forward with an initiative campaign for November. The more likely route, sources said, would be with a November election rather than risking legal challenges to muscling it through on a majority vote. 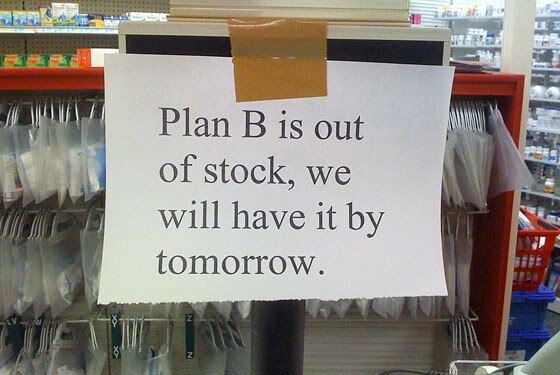 The problem with the above versions of Plan B are that they carry major risks. A November ballot would mean that the tax "extensions" become tax "increases" since the temporary taxes that Brown wants extended expire June 30. The majority-vote strategy raises legal questions which could delay plans for an election if raised in court. In particular, such litigation could delay any majority-vote election beyond June so - again - the extensions become increases. Opinion polls suggest voter support for extensions but not for increases. Any election held after June creates an additional problem. The budget (which can be passed by a simple majority) will assume tax extensions/increases. If voters don't approve, the budget would be seriously out of whack and a drastic correction would have to be made part way into the fiscal year. What a town. I was at Walgreens the other afternoon and was stunned by the number of people lined up to buy potassium iodide to ward off the possible effects of radiation wafting over from Japan. Even more stunning was watching those same people, clutching their iodide protection, proceed to jaywalk across New Montgomery Street and dodge cars in their rush to get back to work. Even if Brown did come up with a deal to win over a couple of Republicans, there is no way the Democrats would go for either the hard spending cap or the pension reforms that the GOP want. The Dems' supporters in the teachers and public employees unions would never stand for it. We might just wind up with a stalemate until at least May with everyone hoping the "revise" revenue figures will somehow keep them from having to make the doomsday cuts the governor has been predicting. In that case, they will have gone from kicking the can down the road to just hoping they can find a can to kick. Does a college degree guarantee a good job? UCLA History: Who's Buried in Westwood?